Early this year, liver specialist Ken Flora and his colleagues sent letters to 1,300 patients announcing exciting news: powerful new drugs to cure the lethal hepatitis C virus were finally available. Soon after, some patients received a different message: notices that their health plans were refusing to pay for the $84,000 drug. So far only about 50 of the patients have received the medicine, Gilead Sciences Inc.Sovaldi. Not since AIDS drug cocktails were introduced almost two decades ago has a medical breakthrough set up such a rush for a life-saving but expensive therapy. Constrained by limited budgets, health insurers and government programs are forced to make hard choices about which patients will get the cure. Many are opting to treat only the sickest. “No one envisioned this drug would cost so much money, so it has knocked back everyone on their heels,” says Flora, who works at The Oregon Clinic, a group of specialists in the Portland area. This was supposed to be a good year for hepatitis C sufferers. Finally there’s a reliable cure for a disease that is estimated to kill more people than AIDS in the U.S. each year. Instead, it has been one of dashed expectations and treatment envy. Medically, it makes sense to treat as many people as possible for the virus, before severe damage has a chance to occur. Trouble is, curing every U.S. patient with Sovaldi and companion drugs could cost $400 billion, assuming some people need to be retreated, according to estimates from hepatitis C researcher Andrea Branch at the Icahn School of Medicine at Mount Sinai in New York. That is more than the $263 billion the U.S. spent on all prescription drugs in 2012, according to government figures. Sovaldi has been prescribed to 60,000 patients in the U.S., according to a report from Robyn Karnauskas, an analyst at Deutsche Bank AG. Many of them had been on a path to liver transplants, cancer and other serious complications. Millions more are infected with the virus, and many who have requested the drug are being told they will have to wait. Mark Hebard is one of them. The 67-year-old retiree suffers from depression, daily fatigue, muscle pain and brain fog. His insurer keeps turning down a prescription for Sovaldi because his liver, while scarred, doesn’t show enough damage. Health insurers and governments are expected to pay more than $10 billion for Sovaldi in 2014. The treatment often involves another drug, Johnson & Johnson’s Olysio, which analysts estimate will generate $2.2 billion in sales this year. Sovaldi alone costs $1,000 a pill, or $84,000 for a typical 12-week course, which has made it a flash point in the controversy over the rising price of specialty drugs. Seventeen tumor medicines introduced since 2009 cost more than $10,000 a month, according to data from Memorial Sloan Kettering Cancer Center. Some specialty medicines can go as high as $600,000 a year. Most expensive drugs, though, are for rare genetic ailments or uncommon tumors, limiting the budget impact. Hepatitis C, by contrast, affects at least 130 million people worldwide. The debate around Sovaldi’s cost pits patients’ interests against the need to reward pharmaceutical innovation. Gilead, which got the medicine in 2011 with the $11 billion acquisition of Pharmasset Inc., says the pricing is appropriate considering the product’s potential impact. The company is treating some uninsured patients for free, though it won’t disclose the exact number of people benefiting from its compassionate use programs. It declined to comment on the cost of manufacturing Sovaldi. Some economists say paying Sovaldi’s price now will encourage companies to develop breakthroughs in the future. “The goal is to improve people’s lives, not to save the insurance companies’ money,” said William Comanor, a professor of health policy and management at the University of California at Los Angeles. The Gilead drug was approved in December in the U.S. and can cure the disease in 90 percent of patients, when used in combination with other medicines. Older regimens had a lower success rate and many patients suffered harrowing side effects. The quickest applicants were rewarded with approvals. By March or April, though, “it had dawned on people how expensive these regimens were going to be and the doors closed,” Flora said. In private, local insurers told him they had had no idea the drug was going to be so expensive, he said. Now Flora has mostly stopped trying to get Sovaldi for those who don’t have liver cirrhosis or other severe complications. He tells patients they should hang tight until new drugs become available that cost less or have better insurance coverage. There may not be long to wait. AbbVie Inc. could get approval for a new multidrug treatment regimen later this year. Bristol-Myers Squibb Co. has two hepatitis C drugs under review by U.S. regulators and Merck & Co. is in the final stage of tests for a new hepatitis C therapy, containing multiple drugs. For some with early disease, it may be prudent to wait for future regimens, according to recent guidance from several medical groups. But many patients are upset because they have already spent years waiting for a safer, better treatment. Instead, the toll from the infection is continuing. Flora’s clinic diagnoses new cases of hepatitis C-related liver cancer every week. Gilead will make big profits even if only a fraction of eligible patients get Sovaldi. Sales of the drug were $2.27 billion in the first quarter, putting it on target to become one of the best-selling medicines in the world in its first year. When Gilead announces earnings after the market closes today, analysts expect the company will report that Sovaldi sales reached $3 billion last quarter, according to an average of 11 analysts’ estimates compiled by Bloomberg. Hepatitis C is known as a silent epidemic because it produces few symptoms for years and many patients don’t know they are sick. It’s caused by a virus spread through contact with infected blood, often via contaminated needles or improper sterilization of medical equipment. 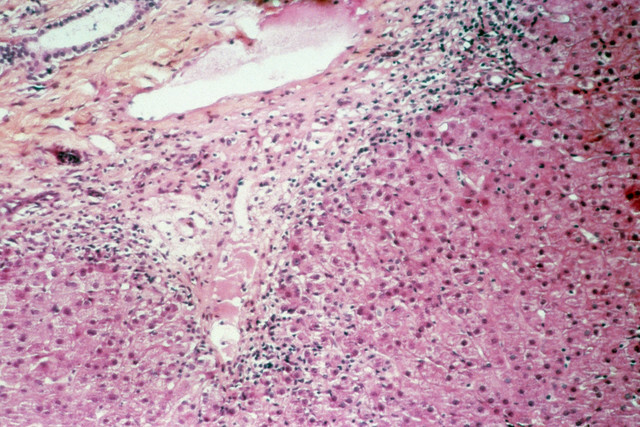 About 5 percent to 20 percent of people initially infected develop cirrhosis after 20 years, the U.S. Centers for Disease Control and Prevention said. In some states, treating every hepatitis C patient on Medicaid, the government health program for the poor, could double the entire pharmacy budget. In Oregon, for example, the $168 million required for one-third of the state’s Medicaid patients, accounts for almost half the state’s annual Medicaid pharmacy budget, said Jeanene Smith, chief medical officer for the Oregon Health Authority. In Texas, Medicaid isn’t paying for Sovaldi or Olysio until it decides on criteria for which patients get coverage, said Stephanie Goodman, a spokeswoman for the Texas Health and Human Services Commission. Imtiaz Alam, a gastroenterologist and hepatologist in Austin, Texas, has about 40 Medicaid patients who have been denied coverage amid the wrangling. “We are trying to help them and we are getting all these barriers,” he said. The people in limbo include Renee Marie Howard, a 58-year-old Austin resident, who is in the early stages of liver failure. She got hepatitis from a blood transfusion decades ago, failed older drug regimens and suffers symptoms that keep in her in bed 18 hours a day. In December, the makeup artist was thrilled when Alam told her about the new drug. When she came back to get the treatment in May, he said the money wasn’t there and she might have to wait another half year. This month, she found out she had developed abnormal blood vessels in the esophagus, a liver disease complication that can lead to severe internal bleeding. Your request has been submitted. A Portland IPA representative will be in touch with you shortly. Please complete the following form to request a new member account be created for you.